It is possible you have a "brand name" or "unique" heater that is not listed in either the alphabetical list or the list by wick number. Don't give up, as working together we can almost always find a wick that will make your heater work as well as new. 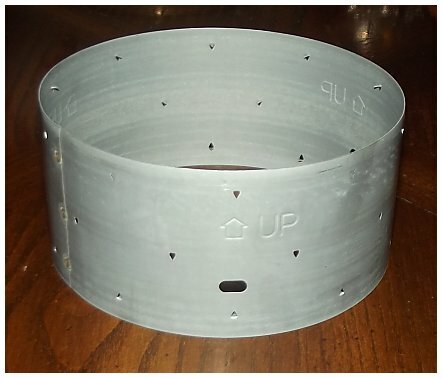 Those "odd" heaters were made by a reputable factory and sold to a chain store or other retail outlet under a different name and model number, or sold (even manufactured) in a different country under another name and model number. So the wicks are available...it's just a matter of matching the proper wick with your individual heater. I have wicks to fit Wards, Kenmore, Zibro, Eurostove and other heaters which simply do not exist on any list of heaters. What we need are the measurements of your old wick and heater, and only you can do that. I have over 100 different models of wicks in stock, and I've measured and recorded the size of every one of them. You can e-mail me with your wick measurements, and I will compare them with my list of wick measurements and let you know which wick will fit your heater. There are four critical measurements I must know: (1) the wick diameter; (2) the wick width, (3) the wick length; and (4) the distance from the TOP of the wick to the pins (if any), or any wick attachments. The wick must fit precisely in the wick gap. 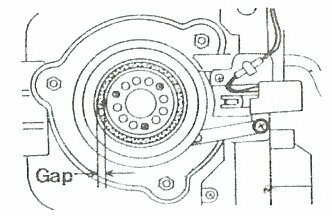 The wick diameter is found by measuring the width (diameter) of the central air pillar (center in the illustration above) and the outside diameter of the wick opening, or "gap." The wick must fit into the wick "gap." 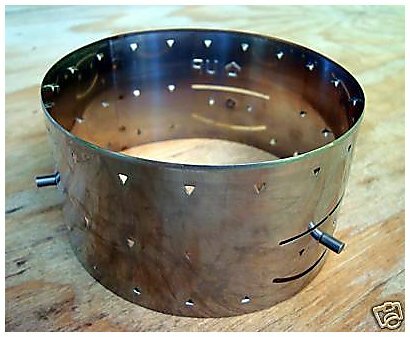 Just as an example, the central pillar (around which the wick fits) measures 2 1/2", and the outside-to-outside measurement (outer edge of each side of the wick gap, across the air pillar) is 2 5/8". The diameter of the wick is the average of those two measurements. In this case, the wick would be 2 9/16" in diameter. There are 12 different wick diameters, so this is an important measurement. 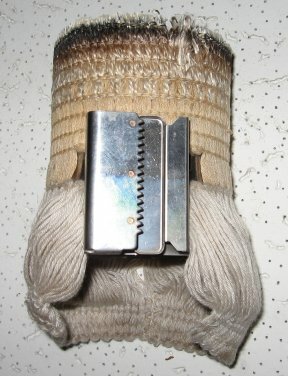 The wick length and width is found by measuring the wick when removed from the heater. The wick will have to be removed in any case, so this is a relatively easy measurement to make. 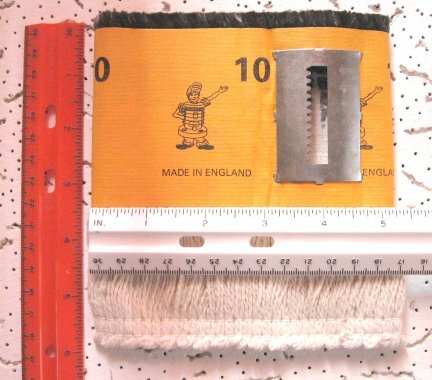 (It is a whole lot easier to remove and measure a dry wick, so empty the fuel tank and burn the wick dry if at all possible.) Remember that you wouldn't be replacing the wick if it were burning like new, so it was probably about 1/8" to 1/4" longer than your measurement. Note the metal wick raising attachment on the wick illustrated - that is an important factor in identifying the correct wick. This wick is 5 1/4" wide and 5 3/4" long. The distance from the top to the pins (if any) is important because some wicks are the same diameter and length, but the pin placement can be either 2 or 2 1/2" below the top of the wick. Once again, we have to assume the wick is burned down a little or you would not be needing a replacement wick, so add 1/8" or so to your measurement. If a wick with the pins 2" from the top of the wick is installed in a heater designed for a 2 1/2" pin depth, the wick simply will not be able to be raised sufficiently to burn properly. Conversely, if a wick with a pin depth of 2 1/2" is installed in a heater designed for a pin depth of 2", the wick will sit too high and not retract sufficiently to turn the heater off, and will be too high for efficient and proper burning. 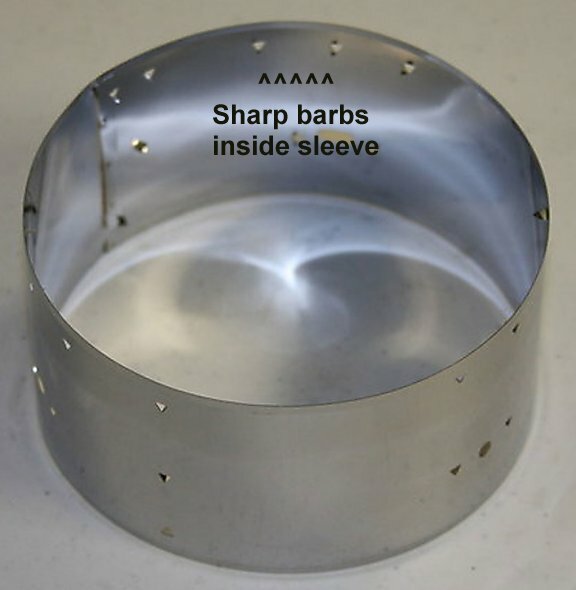 The wick sleeve for an unpinned wick has sharp barbs on the inside to hold the wick in place. The pins (if any) are on the sleeve itself, as in the photo above. Click on the photos to enlarge them. Pinned wick sleeves have 3 holes for the pins on the wicks to go through, as shown above and no sharp barbs on the inside of the sleeve. 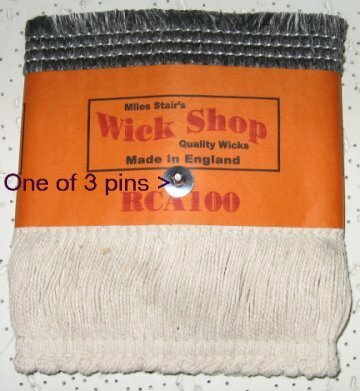 With those three (or four, if the wick is pinned) measurements, you can e-mail me with those measurements, I check my list of wicks sizes and let you know which wick will fit your heater. Then a perfectly good kerosene heater can be used again - and burn as it did when new! No, this isn't as easy as simply reading a list and finding the wick number listed, but it will work and get your heater working again! 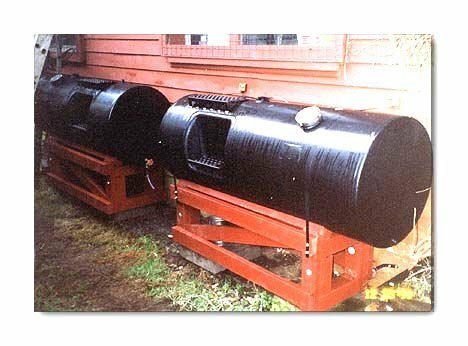 Modern kerosene heaters were invented in Japan and they established the standard dimensions used for those wicks. 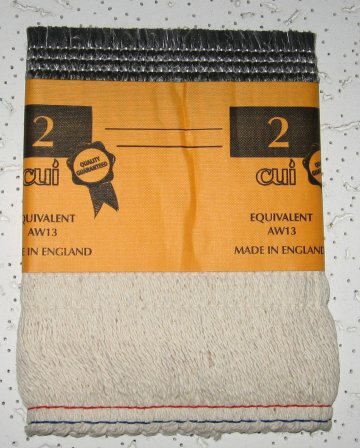 There are other sizes, of course, but the vast majority of wicks will have one of the measurements below. 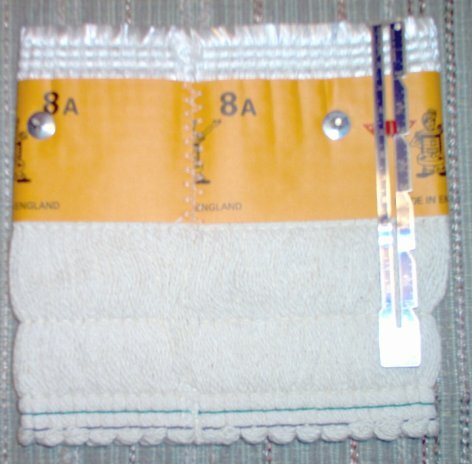 Remember, these are the FLAT WIDTH of the wick across the cloth band when the wick is pressed flat. The length will vary and you will also need to let me know that measurement. There are times when finding a new wick to fit a very obscure heater takes more work, but it can be done! 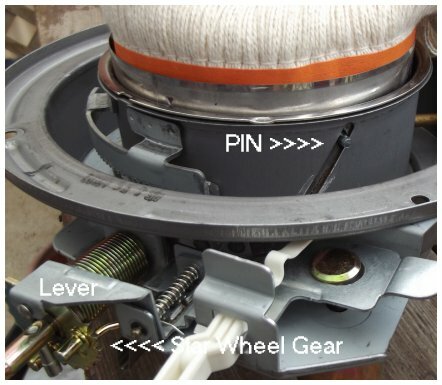 The photos below show the process of replacing a wick for a Handy Master 9700 BTU heater. 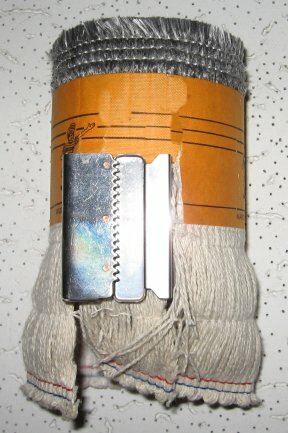 The wick was originally sold with the wick sleeve, but that combination is no longer available. So I modified a wick to fit the old wick sleeve, cut off the old wick, and slipped a new wick over a plastic guide. Then the plastic guide was pulled out from the bottom so the wick could be grabbed by the sharp points on the stainless steel wick sleeve. It worked! Now a perfectly good heater can be put back into operation. Wick in sleeve, obviously needing replacement. 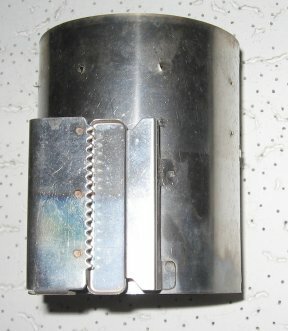 The wick sleeve after the wick was removed. A guide made from the center of a plastic gallon jug. A new wick slipped over the wick sleeve and the plastic guide pulled out from the bottom. The plastic wick guide is what makes it possible to slide a wick over the sharp points on a solid wick sleeve. The plastic must be thin and flexible while at the same time being sturdy enough so that the sharp points do not dig into the plastic so it cannot be withdrawn from between the wick and the sleeve. I use the smooth plastic from the middle of a kerosene or Mineral Spirits gallon container. This sleeve is 11" long, 4 1/2" wide, the slots are 1 5/16" on center and 3 1/2" deep. Different wick sleeves would require different dimensions on the plastic guide, of course.